It is colder this morning in Moosomin, Saskatchewan than at the South Pole. 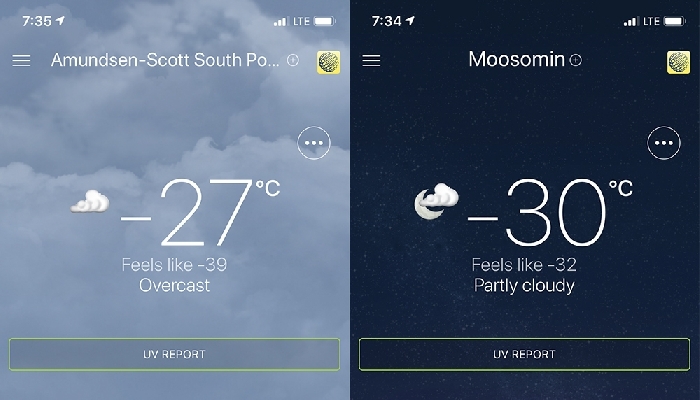 Actual temperature around 7:30 this morning was minus-30 in Moosomin, and a balmy -27 at the Amundsen-Scott Research Centre at the South Pole. Temperatures are expected to stay chilly in Moosomin through the weekend, with highs of -22 and -18 Saturday and Sunday, so bundle up out there! Not surprisingly, the forecast is for wind from the north at the South Pole, since every direction is north from the South Pole.